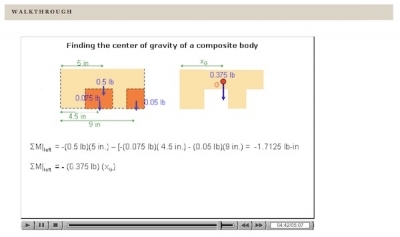 The OLI Engineering Statics course takes a distinct approach to Statics in part through a reorganization of the order in which topics are presented. 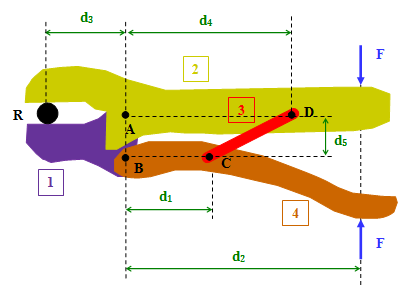 The authors believe a first exposure to equilibrium with a ttention to free body diagrams and the summation of forces and moments is valuable before the introduction of couples, static equivalence, and engineering connections. The sequence of topics in OLI Statics is different from traditional textbooks only in the first two Units. But, the differences are easily manageable. To aid instructors and students who wish to use OLI in c onjunction with a traditional textbook, we have devised a mapping between OLI units and modules, and typical chapter/sections in textbooks. In academic sections of the course, besides providing students with real-time assessment and feedback by means of interactive exercises, the OLI Statics course gathers information on students’ on-line learning activities that instructors can use to inform classroom instruction. To provide instructors with such information the Learning Dashboard (LD) was developed. The Learning Dashboard is an analytic system that uses a statistical model of students’ learning to analyze clickstream data in real time and provide useful and interpretable inferences, recommendations, and data visualizations for instructors. 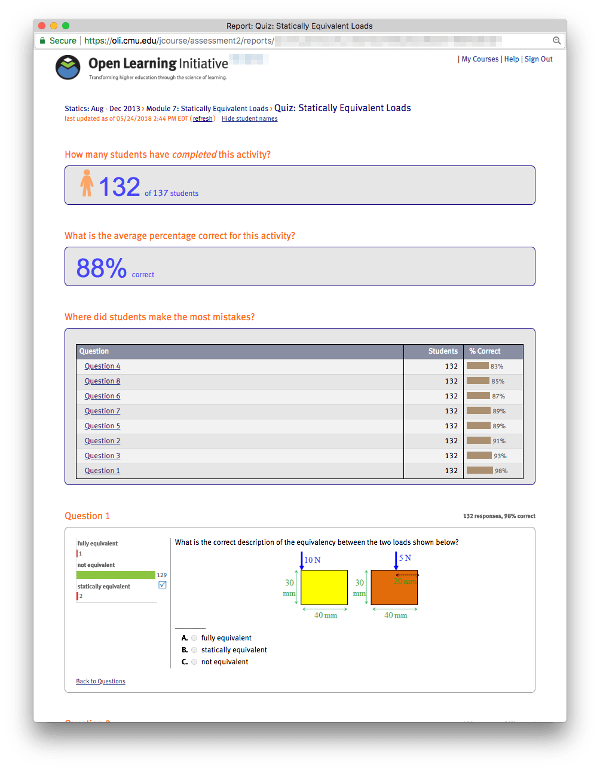 The Learning Dashboard helps instructors monitor students’ progress, identify students’ difficulties, and even “drill down” into the data to see students’ responses on individual problems. This information allows the instructor to pursue remedial instruction to address individual students’ needs and those shared by larger groups of students. When instructors utilize the information to identify common student difficulties, classroom activities can be focused on specific concepts and skills that need elaboration and reinforcement. 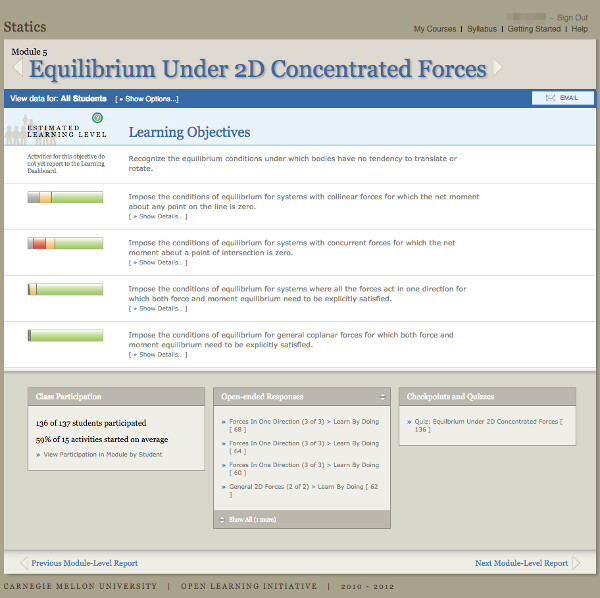 The image below shows the screenshot of the Learning Dashboard main page for Module 7 “Statically Equivalent Loads.” Based on an analysis of students’ performance on activities targeting a given learning objective, the system computes and displays graphically the Estimated Learning Levels for each of the learning objectives of the module. In particular, the proportion of the class at each learning level (red=low, yellow=moderate, green=high) is proportional to the respective portion of the bar, with gray representing students who have completed too few activities to enable a prediction. 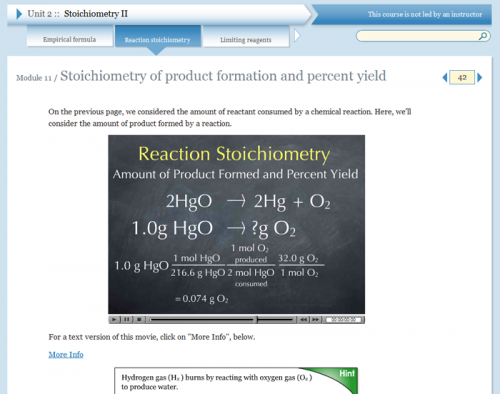 Screenshot of the main page of the OLI Engineering Statics Learning Dashboard. To obtain more information about students’ progress and performance on a learning objective, the instructor clicks on that bar and the more detailed view shown below is revealed. Further clicking on the dots would show display the names of students in each of the above categories. 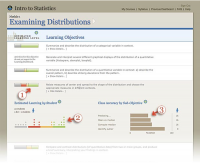 Screenshot of detailed information on Estimated Learning of one Learning Objective. There are many other “hot links” on the bottom of the main LD page (Figure 3), each allowing the instructor to view different aspects of students’ activities and performance. 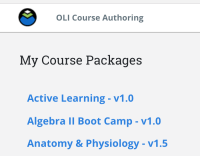 In particular, at the bottom left of the LD main page is a link to a list of percentages of activities in the module in which each student engaged. The reports also quantify overall class use of interactive exercises aggregated across all students in the class. 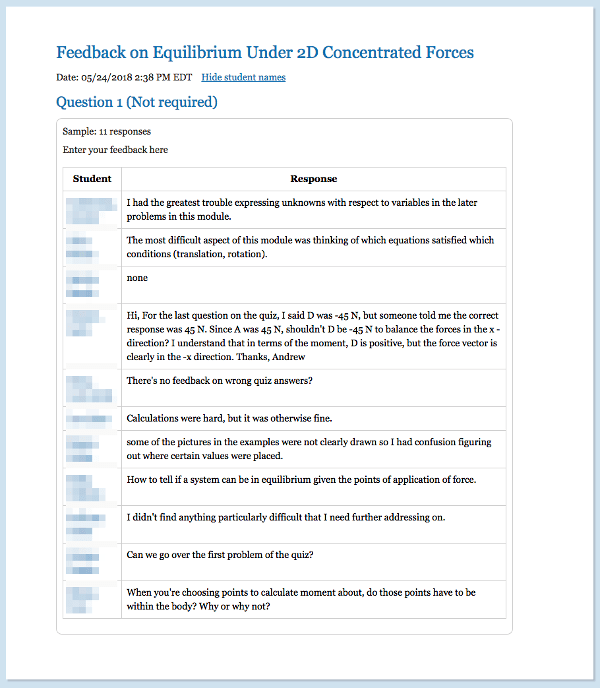 At the bottom in the middle of the LD main page is a link to My Response, where the instructor finds students’ written comments and questions as shown here. Excerpts from Module 5 My Response Report. As a basis for a classroom discussion, an instructor may want to know how students answered individual questions, at least in an aggregate way. Learning Dashboard provides such feedback on virtually all inte ractive exercises. 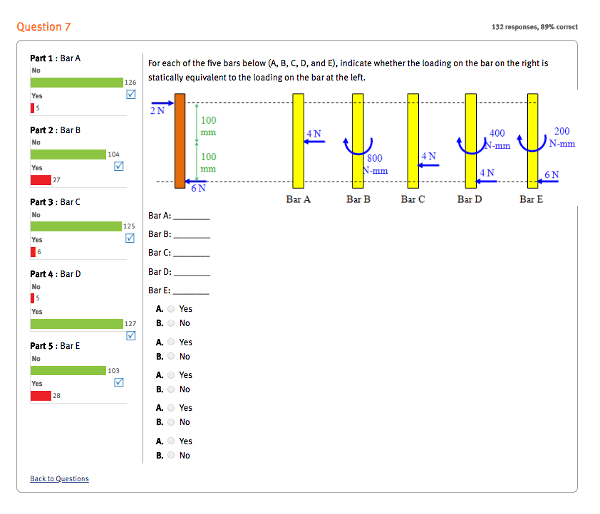 For example, excerpts from the Module 7 Quiz Report are shown in in the next two illustrations. In summary the Learning Dashboard gives instructors a high-level overview of how students in a class are performing on the learning objectives for each module in the course. This gives instructors a rich view into what has always been a black box. Before going into class, instructors can quickly see the concepts students are grasping as well as the concepts with which students are struggling. 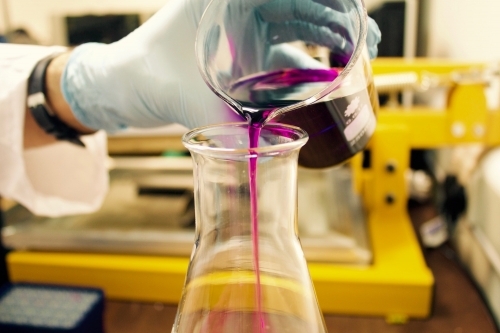 This enables instr uctors to spend their time with students in a way that better utilizes their expertise. The scores on end-of-module quizzes are reported to a Gradebook (can be exported as an excel file). 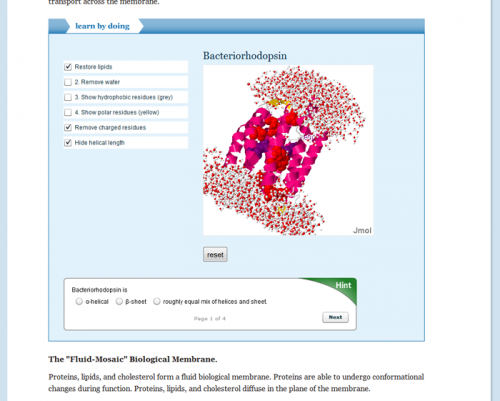 Like other interactive exercises, the instructor can view performance on individual quiz questions and discuss them in class. The authors of the OLI Engineering Statics course have used the OLI Engineering Statics course as part of their classroom-based Statics courses with lecture, optional textbook, and reduced written homework assignments. Our approach, which provides one possible approach for other instructors, is but one means of integrating OLI courseware. We call this approach the inverted classroom, because first contact with new material and formative assessments take place outside of the classroom, and students come to class prepared to be actively engaged.